Learn the most effective ways to practice your guitar. Learn and play your guitar like a pro. 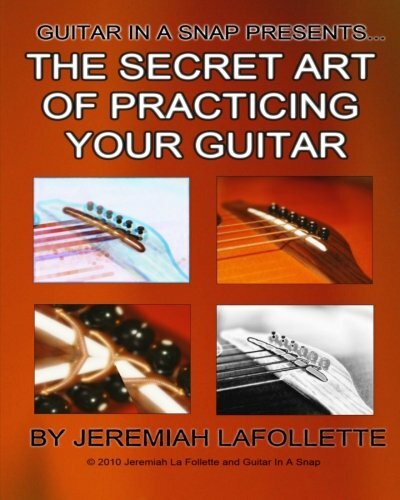 The Secret Art of Practicing will launch you into another dimension of learning your guitar in a snap. Jeremiah La Follette has been playing and teaching guitar for over 25 years. A music degree graduate of Grant MacEwan College; Jeremiah is currently instructing guitar players how to unlock the secrets of the guitar at www.guitarinasnap.com. 1. The Secret Art of Practicing Your Guitar: Guitar in a Snap Presents. 2. The Secret Art of Practicing Your Guitar: Guitar In A Snap Presents. 5. The Secret Art of Practicing Your Guitar: Guitar in a Snap Presents.